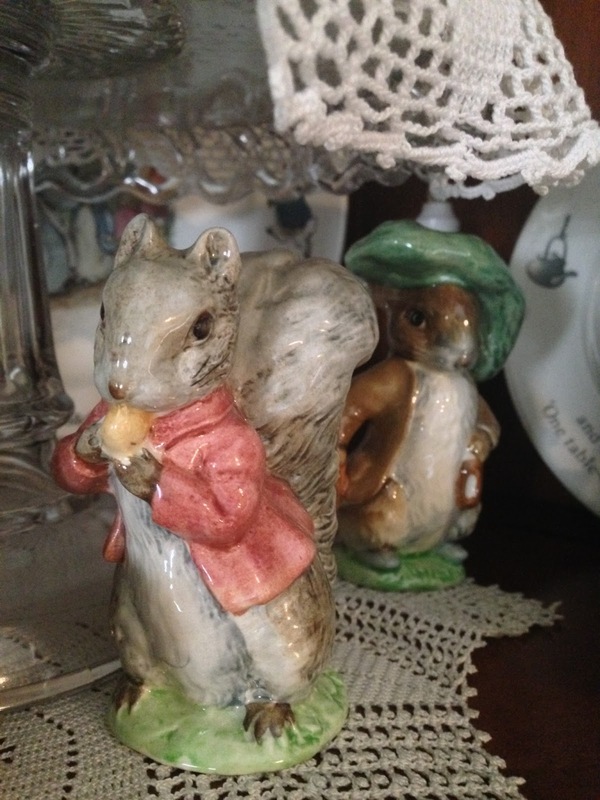 So, on with the blogging! Today is Tea Time Tuesday and I will share a bit of my Peter Rabbit china by Wedgewood. I have been collecting it for years, just bit by bit which is fun. 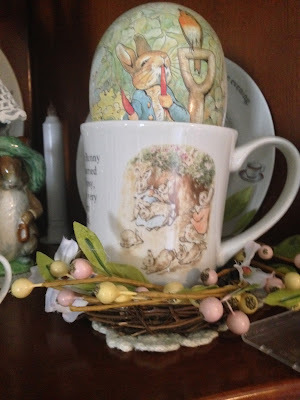 I was able to find a few more cup and saucers this spring. One of these years, I hope to have a Peter Rabbit tea. 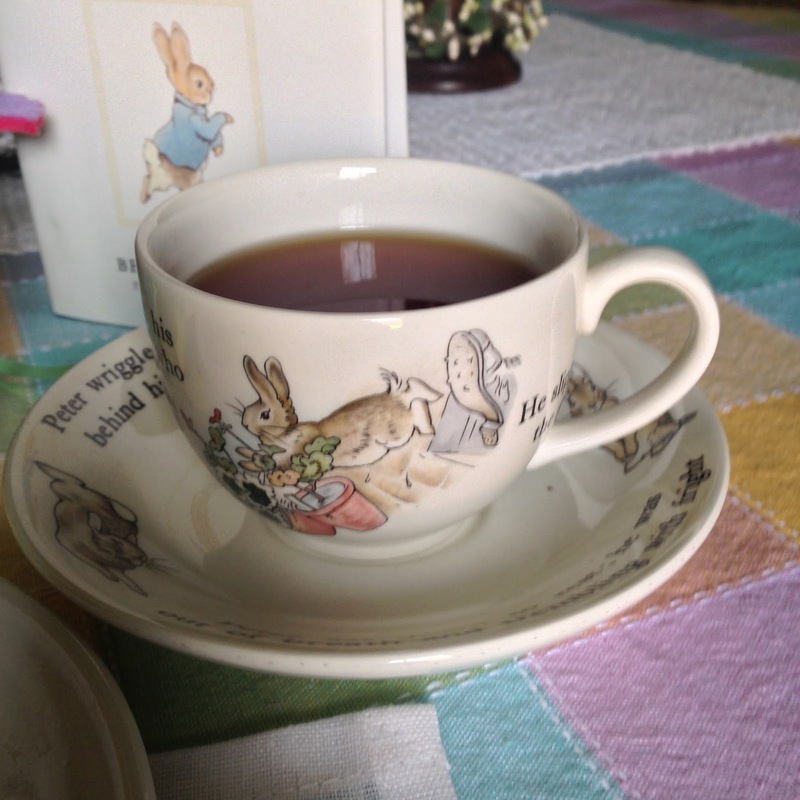 When I returned home to day from my quilting group, I had a cup of tea. I can't eat the yummy cake you see anymore, but it is a family tradition and I still make them for my family. There's nothing like a cuppa in the afternoon to pick you up! It's even better when it's in a charming teacup. This is a Blarney Stone. 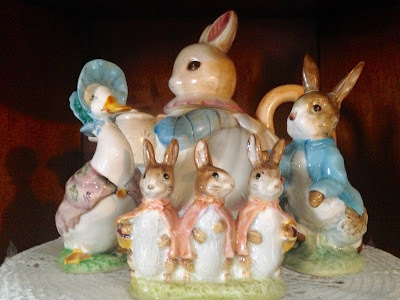 I feature them every Easter because they are a family tradition. My grandmother made the on St Pat's and they were always green. 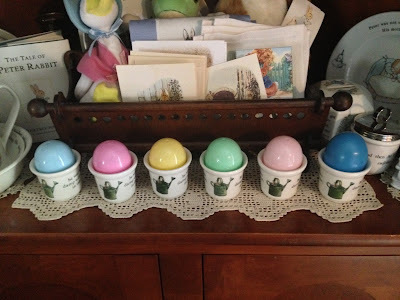 My mom changed the tradition to an Easter dessert and used colored frostings to look like Easter eggs. They are just a white cupcake, frosted all around and rolled in coconut or chopped pecans. 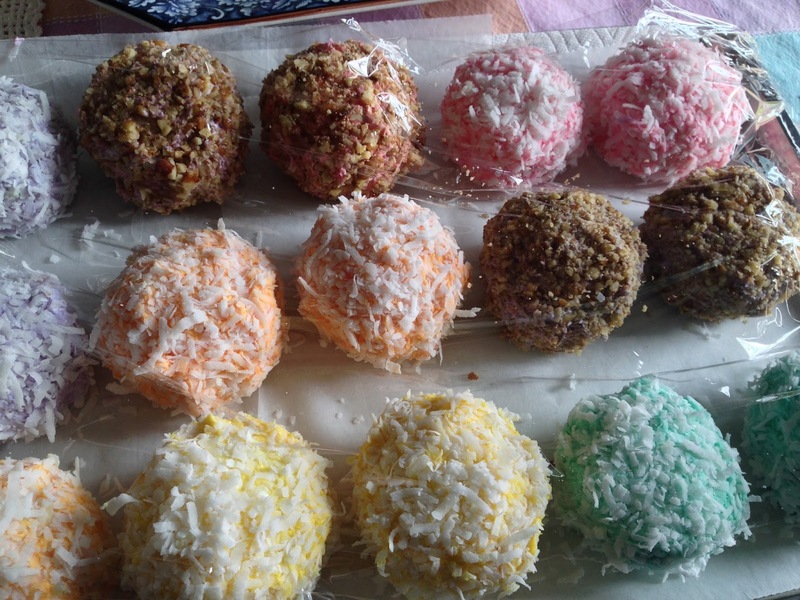 They are really rich, loaded with sugar but they are yummy. 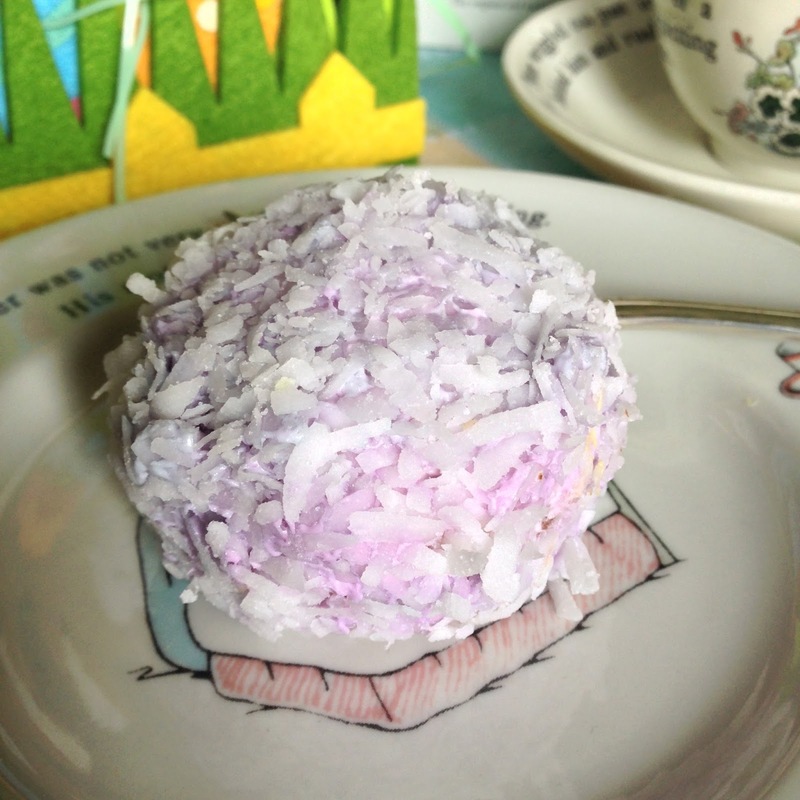 I have made tiny ones for baby showers or bridal showers which are really cute. 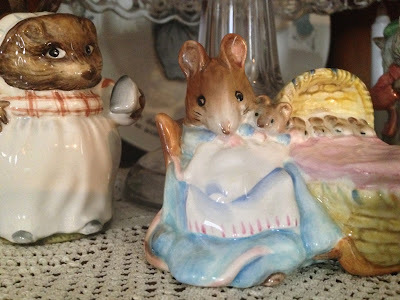 On my way home from my quilt retreat, I stopped at a favorite antique shoppe. I was delighted to find Floppsy, Moppsy, and Cottontail to go along with my little Beatrix Potter animals. So cute! Over the years, I have found several egg cups. I thought they would look pretty cute with a plastic egg resting in each cup. I love it. 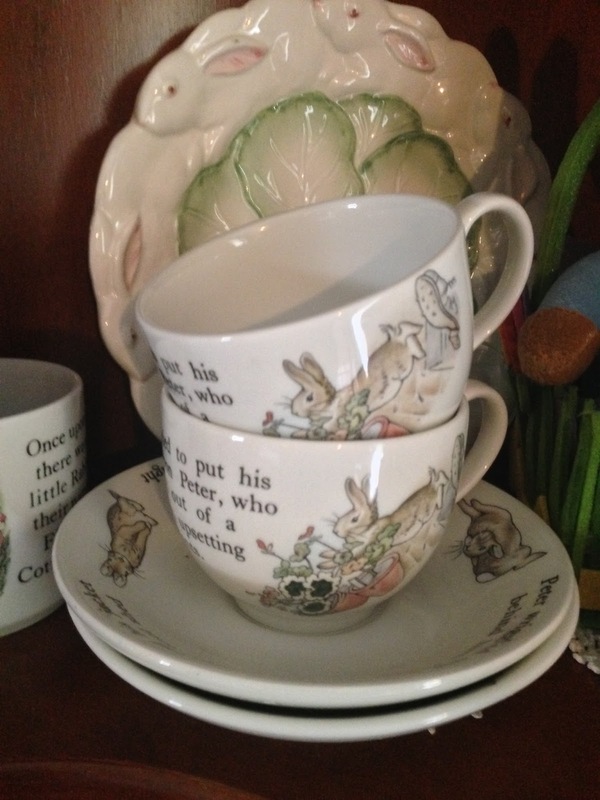 A dolly person MUST own a child sized Peter Rabbit tea set! 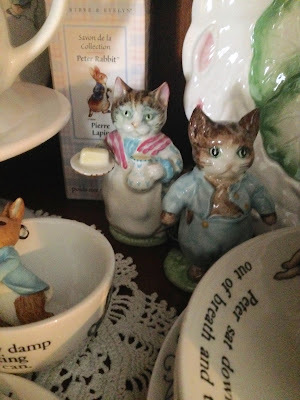 I also have tiny ones for my small dolls. Don't you like the egg sitting in the mug? I only have one of those eggs with a Beatrix Potter design. Lots of Peters...waiting for spring and Easter. 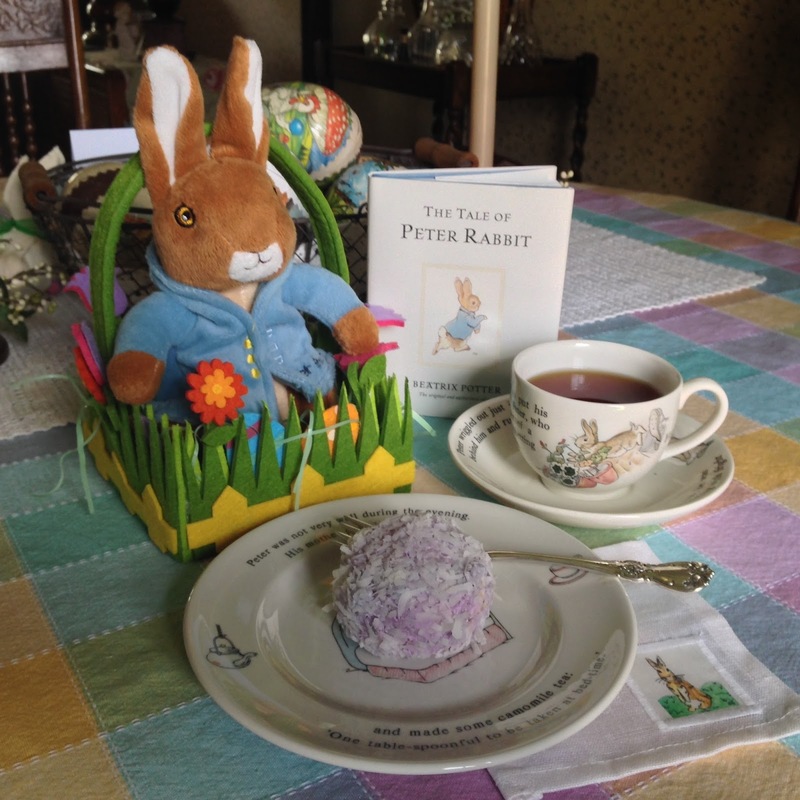 I do hope you had a lovely Easter Sunday. 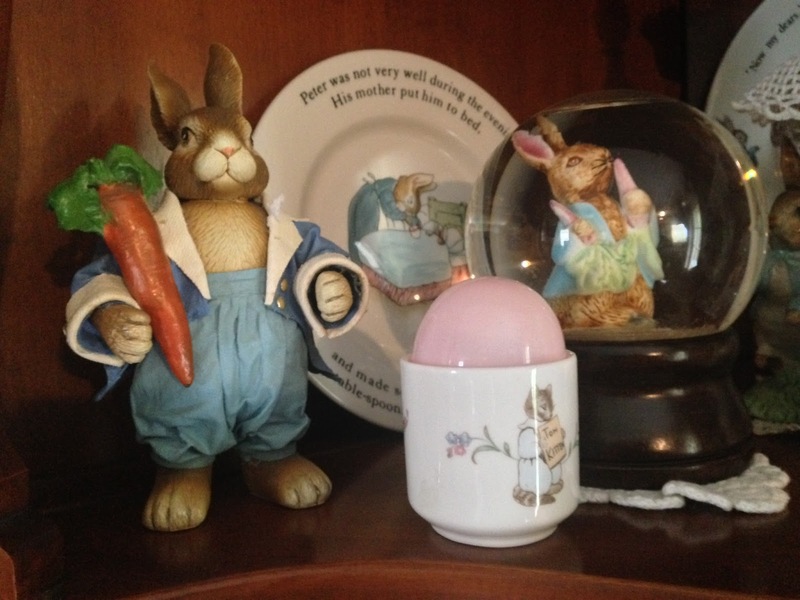 We will have another egg hunt on Sunday to make up for my missing the day with the grands. Kids love egg hunts! You showed us real Easter nobilities. Figurines and cups of rabbit marvellous. Beautiful! Love all your pieces! !Thanks for sharing!Maristella. This is such a darling post! 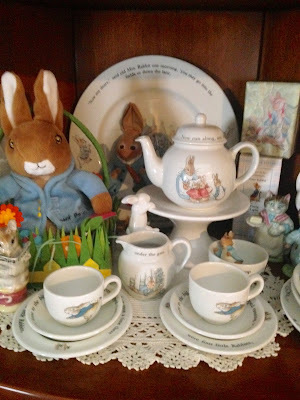 I enjoyed seeing all your Beatrix Potter items! Happy spring to you!